Bioflavonoids CTR® - 500 mg, 90 tablets (Bioenergy) - Penn Herb Co. Ltd.
Bioflavonoids play a role in blood vessel wall maintenance and healthy veins and capillaries. They also aid in Vitamin C absorption and prevent the oxidation of Vitamin C.
Most water-soluble vitamins and minerals such as vitamin C and the B vitamins are not stored in the body. They are quickly excreted within a few hours, and unless taken repeatedly, will not provide the full day benefits. BioEnergy® CTR (Controlled Time Release) tablets provide with ONCE A DAY dosage, a controlled and prolonged release of vitamins and minerals resulting in 16-24 hour sustained benefits to the body. Lemon Bioflavonoids and natural excipients. EACH TABLET CONTAINS: 500 mg of natural Bioflavonoids as Vitamin P. NO animal products. NO yeast, sugar, starch, artificial color, salt, flavoring or preservatives. 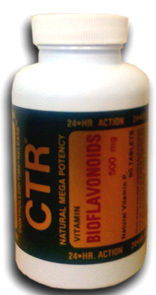 Bioflavonoids play a role in blood vessel wall maintenance and healthy capillaries; help strengthen blood vessels; supports healthy gums. As a dietary supplement, one or two tablets daily ALWAYS AFTER A MEAL.